The Ausserfern - historically fascinating, naturally beautiful and untouched by the ravages of large-scale tourism. The Ausserfern is growing in popularity with holidaymakers and visitors who are looking for a somewhat different holiday in Austria. The area is remote from the rest of the province of the Tyrol but possesses excellent connections for guests from other countries. The aim of this site is to give potential visitors an overview of this lovely region in their own language - and to allow local businesses and attractions to communicate with their guests. Any accommodation requests will be passed to participating partners and we will endeavour to answer any questions you may have about the area. We hope you enjoy this summary of the Ausserfern and look forward to an increasing interest in the region from foreign visitors. Versions of this site are available in German and English. Please let us know if you have enjoyed Ausserfern Direct - and also if there are any areas you wish to see improved or expanded. The Ausserfern has a different history and background from the rest of the Tyrol. Part of this is due to the geography. With the name literally meaning "beyond the Fern(pass)", the region is isolated from the rest of the Austrian province to which it belongs. The region of the Ausserfern was settled by Swabians from the north after the fall of the Roman empire and the region has, since then, always had a strong connection to its northern neighbours. As in many parts of Austria, "civilisation" was reintroduced by Irish and Scottish missionaries. St Magnus, arriving from the St Gallen monastery, founded a settlement which developed into the St Mang monastery in present-day Füssen. 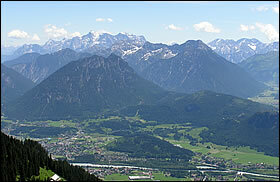 Historically, the area around Reutte lay on the Via Claudia Augusta, the major Roman way which led from Merano to Imst and then over the Fernpass to Reutte and Augsburg. It crossed the Lech at a ford until the bridge across the Lech was built in the 15th century. Later the "Salt Trail" led through the Tannheimertal and brought more prosperity to the area. Originally a collection of hamlets involved in farming, increased population pressure meant that many inhabitants were forced to travel to the Allgäu to find work and a society grew up in which it was normal for the women to run the households and farms for a large part of the year while the men and older children were away working as labourers in what is now Germany. Many of the lovely churches and chapels in the area have connections with the labourers' and workmens' guilds. As a border region, the Ausserfern possessed extraordinary military significance and traces of fortifcations from the Middle Ages remain in the Tannheimertal, the Ehrenberger Klause and in the Zwischentoren area. The Ausserfern also lies close to the historical attractions of the German Imperial Castles and the Passion Play village of Oberammergau.